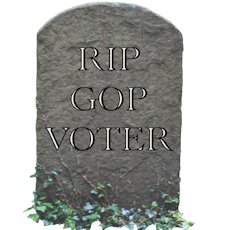 There’s been much written about how Millennials are becoming a reliable voting bloc for Democrats, but there’s been much less attention paid to one of the biggest get-out-the-vote challenges for the Republican Party heading into the next presidential election: Increasing numbers of traditional core GOP voters will no longer turn out to vote straight Republican, because they're are dying of old age. Since the average Republican is significantly older than the average Democrat, far more Republicans than Democrats have died since the 2012 elections. To make matters worse, the GOP is attracting fewer younger first-time voters. Millennials, born 1981 to 1997, now are larger in numbers than baby boomers, born 1946 to 1964. How they vote makes the big difference. In 2012, there were about 13 million young citizens in the 15-to-17 year-old demo group who will be eligible to vote in 2016. The previous few presidential election cycles indicate that about 45-48 percent of these new young potential voters will actually vote, yielding about 6 million new voters in total. Exit polling in the 2012 and 2008 presidential elections indicate that youngest age bracket split about 65 percent to 35 percent in favor of the Democratic Party candidate in the past two elections. If that split holds true in 2016, Democrats will have picked up a two million vote advantage among first-time voters. These numbers combined with the net among voter deaths Democrats and Republicans puts Republicans at an almost 2.5 million voter disadvantage going into 2016. Story published at Politico. "The demographics race we're losing badly," Sen. Lindsey Graham (R-SC) told the Washington Post. "We're not generating enough angry white guys to stay in business for the long term." "A GOP coalition that relies almost entirely on whites could squeeze out one more narrow victory in November," Brownstein writes. "But if Republicans can't find more effective ways to bridge the priorities of their conservative core and the diversifying Next America, that weight will grow more daunting every year."